The other night, because Aden fell asleep early, I caught an episode of Nigel Slater's Simple Suppers. And he made this sticky chicken with lemon and honey that really made me salivate. So today, I thought I would try making this dish. When I looked in my pantry, I realised I didn't have many of the ingredients, so I substituted loads of stuff, but the end results were still super yummy! To start, I used a fork to pierce the skin and flesh of the chicken. This allows the marinate to seep into the chicken, making it more tasty. 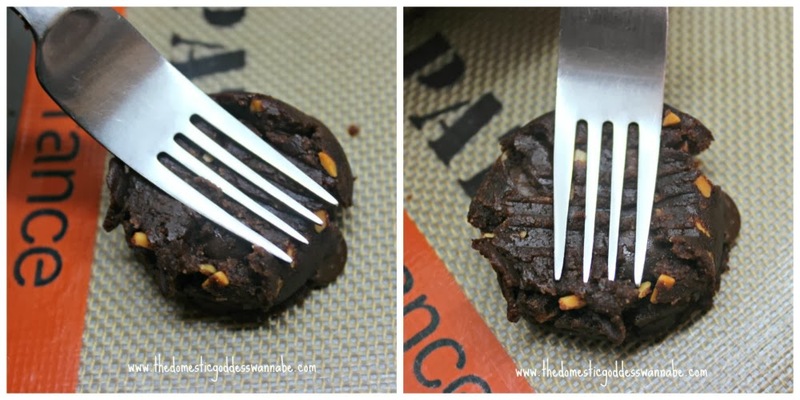 Don't be squeamish - just pierce and poke with the fork! I placed the zest of a lemon in a bowl and added minced garlic. The juice of the lemon was also extracted and added to the bowl. The next ingredient I added was Djion mustard. 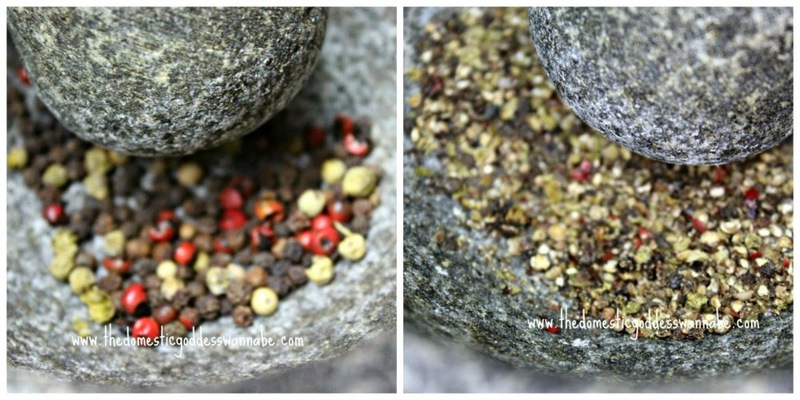 Since I had run out of black peppercorns, I ground some mixed peppercorns and added them to the marinade. Finally, I added honey and salt. I whisked everything to combine. I added the drumlets, mixed everything together and covered the bowl with cling film. The chicken was left to marinate in the fridge for a minimum of 2 hours. While the oven was being pre-heated, I lined a casserole dish with aluminium foil and sprayed with olive oil, The chicken drumlets were placed on the foil, and the lemon and honey mixture poured over the chicken. The drumlets were roasted for 45-50 minutes. I turned the chicken once half way through the cooking process. Once the chicken drumlets were brown and cooked through, I sprinkled some chopped coriander and served them hot. 1. Use a fork to pierce chicken skin and flesh. 2. Mix all ingredients together and pour over chicken. 3. Stir to mix. Cover bowl with cling film and marinate chicken in fridge for minimum 2 hours. 4. Line roasting tray with aluminium foil. Lightly grease. 5. Place chicken on foil. Pour all the lemon and honey mixture over the chicken. 6. Roast at 200C for 45-50 minutes, turning the chicken once half way. 7. Sprinkle chopped coriander over chicken. It has been a while since I made a Korean stew. I love Korean food, but because the LAM is not too keen on it, we rarely go to Korean restaurants. Since I like quite a few Korean dishes, I knew I had to figure out how to cook them for myself. Today, I made Sundubu Jjigae. This is a hot and spicy stew made with tofu, meat and/or seafood and vegetables. Before I made the stew, I first made the stock by boiling together seaweed and dried anchovies for 20 minutes and then straining the mixture and reserving the stock. To make the stew, I first prepared the ingredients I was going to use: sliced pork - not pictured (or beef or chicken), shitake mushroom, zucchini, onions, clams and spring onion. In a saucepan, I heated some olive oil. Into this, I added the pork and stir-fried the pork until it had mostly turned white. If I were to cook a single portion, I would make use of my earthenware pot but since I was cooking enough for 4 to 6 people, I used a saucepan instead. Into this, I added the mushrooms and continued stirring. Once the mushrooms had wilted a little, I added onions. Then in went the hot pepper flakes. Here, I added 3 tablespoons of hot pepper flakes. 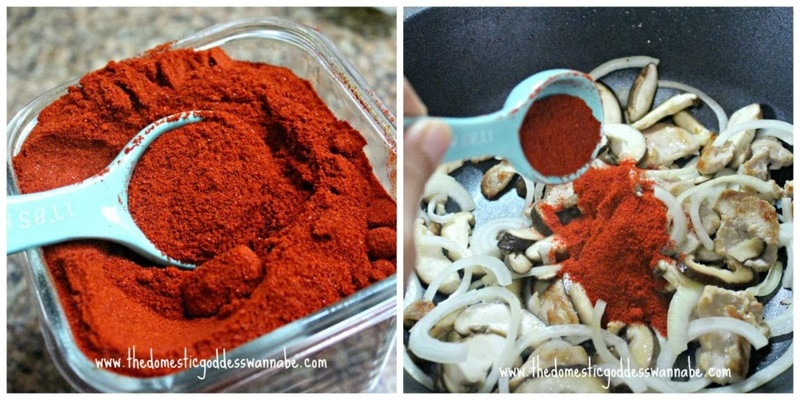 If you are prefer the stew to be less spicy, add less pepper flakes. Everything was stirred to combine before I added the stock. There will be quite a bit of hissing and bubbling. Just be careful and don't get scalded! You would want to just cover the ingredients in the saucepan. The clams (or your choice of seafood), zucchini (or your choice of vegetables) and minced garlic were added. I also added the toufu - I simply squeezed the toufu into the stew and used my spoon to break it up into smaller pieces. Finally, I added fish sauce, spring onions, eggs and sesame oil, gave everything a good stir, and served the dish immediately, with some rice. This is pretty authentic Korean cooking, and as you can see, it really is not very difficult at all!! This tastes as good as any of the sundubu jjigae you taste in restaurants but cost a fraction of the price. All is good, I'd say! 1. 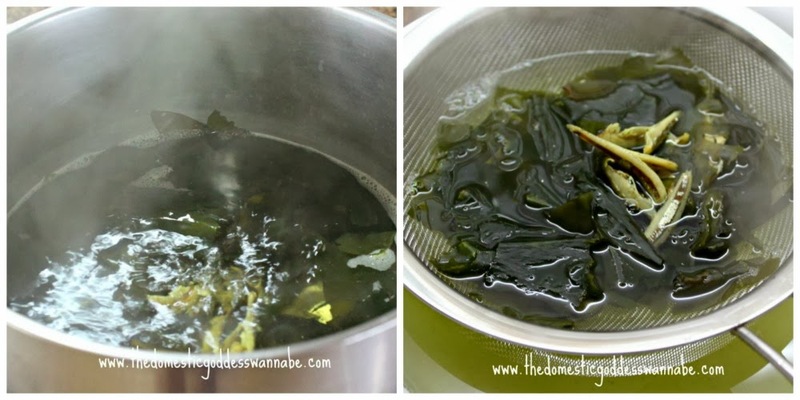 Boil anchovies and seaweed for 20 minutes. 2. 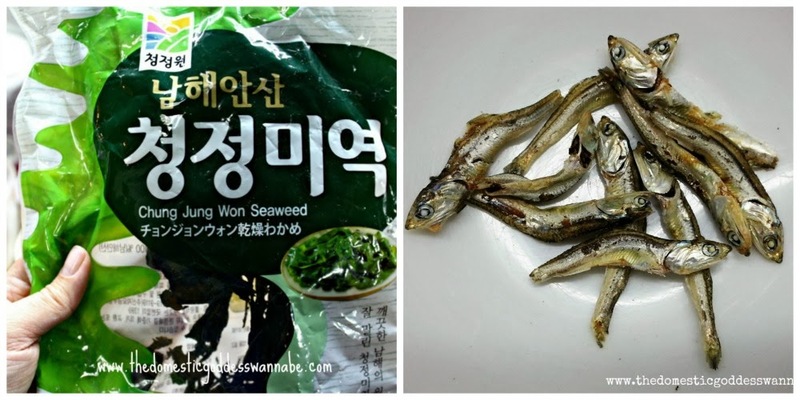 Retain stock and discard anchovies and seaweed. 2. Heat olive oil in saucepan. Add pork and cook until most of the pork has turned white. Add mushroom. 3. Once mushroom has wilted a little, add onions. Stir to combine. 5. 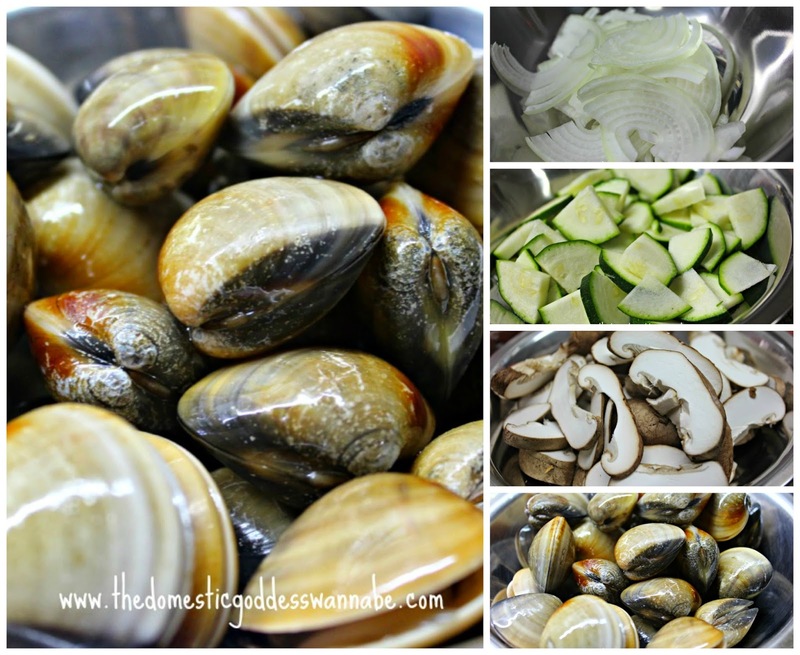 Once stock starts to boil, add clams, zucchini and minced garlic. Stir. 6. Add toufu, and use spoon to cut toufu into smaller pieces. 7. Add fish sauce, spring onion and sesame oil. 8. Serve immediately, with rice. 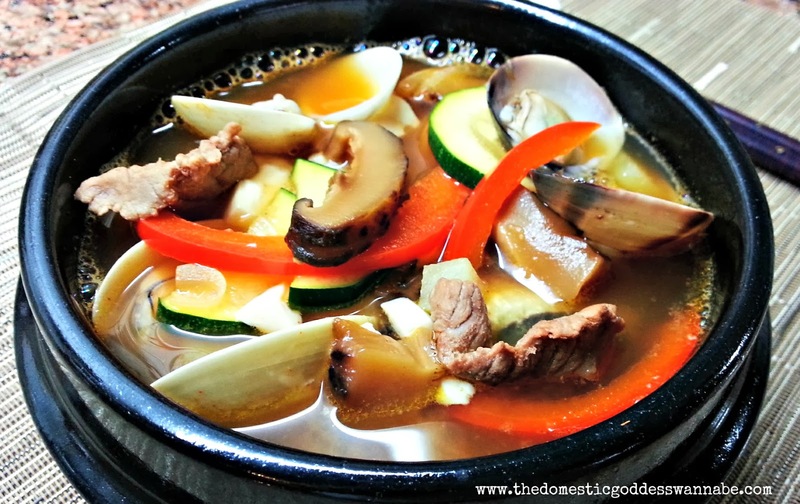 If you like this, you will definitely like this recipe for beef doenjang jjigae (된장 찌개) - korean soy bean paste stew! Apart from the fact that these pies are really easy to make, they are also great for using up left-overs. Being a prudent home cook, I really detest any wastage. There are always days in each week when I would flip through what I have in the fridge or freezer or pantry to see what needs to be used up pretty soon. And I would plan my menus around that. One can easily eat two of these mini-pies for breakfast or as a snack, so even though I make 12 at one go, they don't hang around for very long. 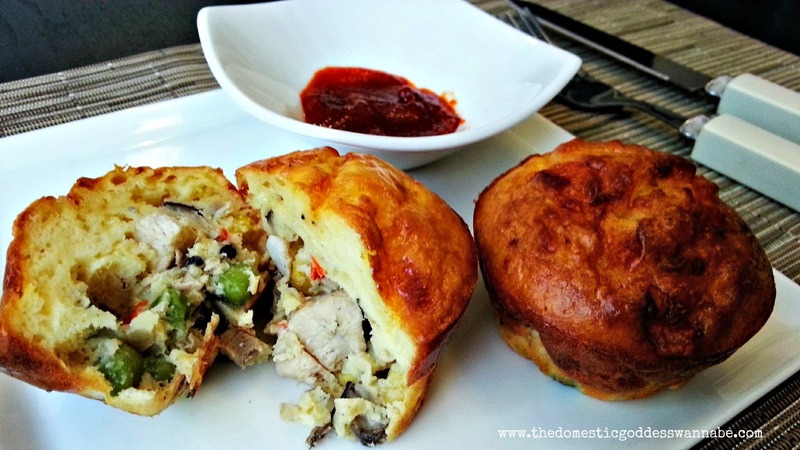 Today I made these ham, red pepper and mushroom pies because I really wanted to finish the ham and mushroom in the fridge. You can use any type of ham or mushroom for this recipe, but I happened to have some picnic ham and shitake mushrooms, which I diced into small pieces. In addition, I also diced half an onion and a red pepper. I was playing on the idea of a hand-held pizza pie combination. The onions were sauteed in a hot skillet in some extra virgin olive oil until soft and translucent, then the minced garlic was added and cooked for a further 30 seconds. I then added the red peppers. The peppers were cooked for about 1-2 minutes - I only wanted to take away the raw taste. Then the mushrooms were added and cooked until they, too, had softened. I added the ham, dried thyme, salt and pepper. Since the ham was already cooked, I gave everything a quick stir to mix, and transferred this into a bowl to cool. While the filling cooled, I made the batter. 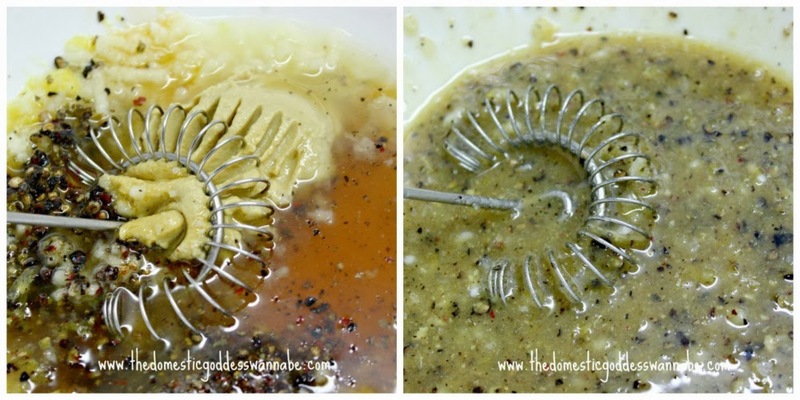 The Bisquick mix, milk and eggs were added into a bowl and mixed with a whisk. Then in went about two tablespoons of filling. Finally I topped each hole with another tablespoonful of batter, and sprinkled some pepper and dried parsley. 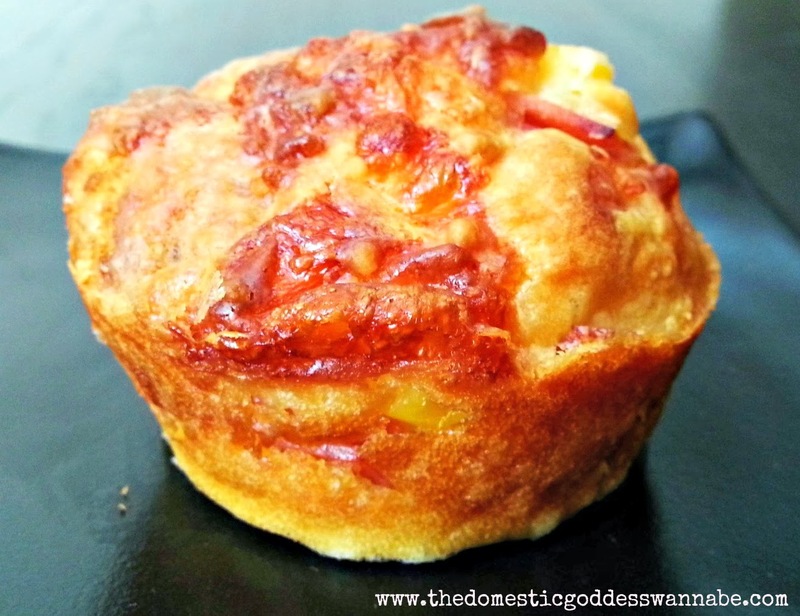 Make these and breakfasts will never be boring again! 2. Add red pepper, cook 1-2 minutes to take away the rawness. Add mushroom, and cook until mushrooms have softened. 3. Add ham, thyme, salt and pepper. Stir to mix. Transfer into a bowl to cool. 5. Sprinkle with black pepper and dried parsley.